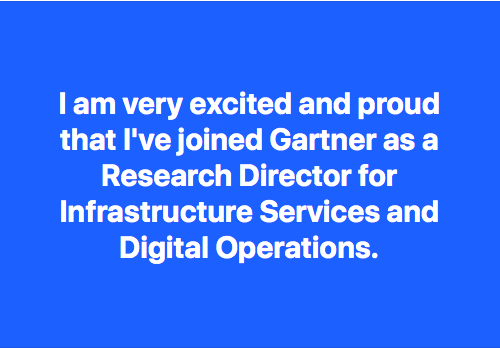 On May 1 2018, I’ve joined Gartner Inc. – the worldwide leading analyst firm – as a member of the Managed Business & Technology Services team. In my role as a Research Director, I am covering Infrastructure Services & Digital Operations. To engage with me, feel free to schedule inquiry calls (inquiry@gartner.com), follow me on Twitter (@ReneBuest) or connect with me on LinkedIn or XING. I am looking forward to talking to you! Please note, I am no longer updating my blog AnalystPOV and my Medium account.